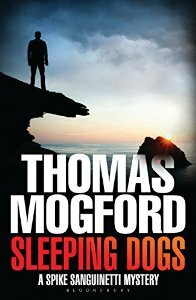 Thomas Mogford is another of my favourite crime writers. Hollow Mountain was in my top five reads last year and he continues to write high quality crime fiction. For his latest book, Sleeping Dogs, he takes his Gibraltarian lawyer/detective to Corfu. It’s a nice change of scenery for the series and, given that I read it in Greece, a perfect holiday read. Spike Sanguinetti is advised by a therapist to go on holiday to help eradicate some of the demons that have been tormenting him. He chooses to visit the house of his business partner on the wealthy north coast of Corfu. But his holiday is overshadowed by the death of the handsome Greek/Albanian Arben on the neighbouring estate owned by the wealthy Hoffman family. When the son of his hosts’s housekeeper is arrested for Arben’s murder, Spike reluctantly agrees to investigate the case. However lives are put at risk as domestic secrets and dynastic feuds ignite. I’ve always been impressed by the evocation of the Gibraltar setting in Mogford’s books. It feels genuine even though I’ve never been to that part of the world. So it was interesting to read one of his narratives set somewhere I am familiar with: a Greek island. Mogford puts enough language and local flavour into descriptions of the place to bring alive the setting without it dominating the plot. In Sleeping Dogs, as well as investigating the killing of Arben, there’s a focus on Spike’s domestic arrangements. This is first seen through his relationship with Charlie, the child he rescued in the previous book, Hollow Mountain, and then in Corfu as he attempts to resurrect his relationship with his childhood girlfriend Jessica. The quality of Mogford’s writing once more shines through and he makes storytelling look effortless. Which I’m pretty sure isn’t the case. Once more Bloomsbury have produced a writer of quality crime fiction. This one is going on the list, Sarah. As you say, Mogford’s got a lot of talent. And this setting does sound irresistible. Thanks, as always, for a fine review. Thanks, Margot. I love Mogford’s books. Wow – your excitement will be REALLY building now! I think if it was me I’d feel compelled to tell everyone. I mean taxi drivers, shop assistants in Superdrug, train conductors. In fact it’d be quicker getting a t-shirt made! “I AM AN AUTHOR” would be good…! I feel a bit like that, Linda, it’s true and the excitement is definitely building! Thanks Sergio. Hope to have that coffee sometime. Are you going to the Bodies in the Library event? Sarah, this sounds like a good murder mystery made salubrious by the Greek setting. Well that worked out well. I went looking for Hollow Mountain and it was a bit pricey over here. BUT the 1st book in the series, Shadow of the Rock, was $1.99 on Kindle and well within my budget. So I got it. Glad you reviewed this one.